Spring salmon three day residential fly fishing course/experience. May 20th-22nd or 23rd-25th 2019. Three day spring salmon fly fishing courses including accommodation, tuition and all food with AAPGAI instructors Illtyd Griffiths, Jonathan Morris and Glyn Freeman. These fly fishing courses are designed to suit the novice, intermediate or the advanced level salmon fly fisher. They are tailor made to meet your aspirations and we will organise everything for you during the three days including equipment if needed. I would like to fish for salmon but do not know what kit to buy and how to know if it is what I need. I have fished for salmon but have problems sometimes with wind or when wading to cast well. I have seen casts performed either at demonstrations or on video but would like to be able to do them. I can fish fine with a floating line but have difficulty turning over the fly when I add poly-tips or large flies. I would like to try out shooting heads and would like to learn how to handle them and manage large amounts of running line? I have some salmon tackle which I am not sure if it suits me but am loath to buy more in case I make a bad investment. I would like to be able to fish a sinking line but find it difficult. I have heard of Skagit and Scandi lines – are they of any use to me and how would I know what I needed? I would like to fish a really nice beat on the Tay and have the expertise on hand to ensure that I am fishing the beat well. I would like a refresher on my casting before my fishing trips next year. I would like to know how to read the river and what to use in differing conditions. I have a habit of losing salmon – am I doing anything wrong? It would be so nice to catch a salmon! In other words we are dedicated to ensuring that all the attendees really get a lot out of the three days on the Tay. We have kept the charges as reasonable as we can to ensure that they are affordable to many salmon or budding salmon fishermen. 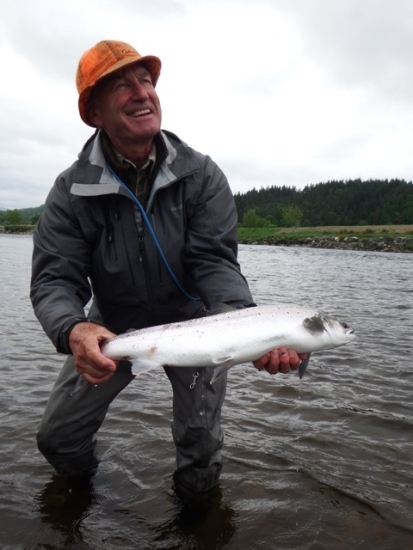 This is an opportunity to fish for spring salmon on the confluence of the river Tummel and the Tay with a realistic chance of a Spring fish. Spring is a great time to be on the river. There will be three fully qualified instructors and the resident ghillie. Accommodation and breakfast will be provided in a very pleasant guest house nearby whilst lunch and dinner will be prepared in the hut (which of course will allow those who are keen to fish on and take advantage of the long hours of daylight). The fishing hut on Lower Kinnaird has been upgraded to a very high standard and is one of the best on the Tay system. It has full cooking facilities, hot and cold water, WC, fridge and freezer. We are very flexible and can meet most requirements. Vehicular access is very good throughout the beat. 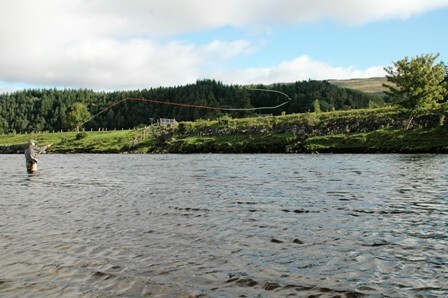 Lower Kinnaird fishes in all heights of water it has a lot of fast runs and pools which are perfect for the fly during lower water. 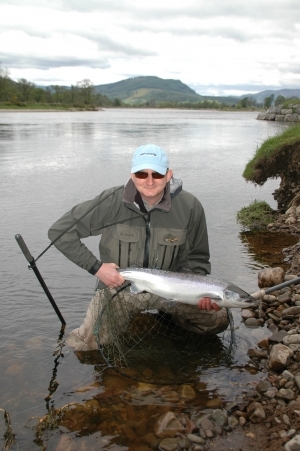 In fact the great Ashley Cooper believed it had the best fly water on the whole of the Tay. The best known pools on the beat are: Junction Pool, Ferry Stream, Swimming Pool, Island Stream, Green Bank, Ash Trees, New Pool, Fir Trees, Kindallachan and Guay. The cost includes three days fishing permits, equipment if needed, tuition with three instructors, prepared food at the hut both lunch and evening dinner, two nights accommodation with breakfast (either on the Monday and Tuesday or Thursday and Friday) at the guest house. Further nights at the guest house www.dalshian.co.uk can be arranged at competitive rates.